Transparency is hard to pin down. It can be the condition of a substance or a physical object, a goal, or an everyday practice of private or public persons, companies, organizations and institutions (e.g. Bessire, 2006; Hansen, Christensen, & Flyverborn, 2015). 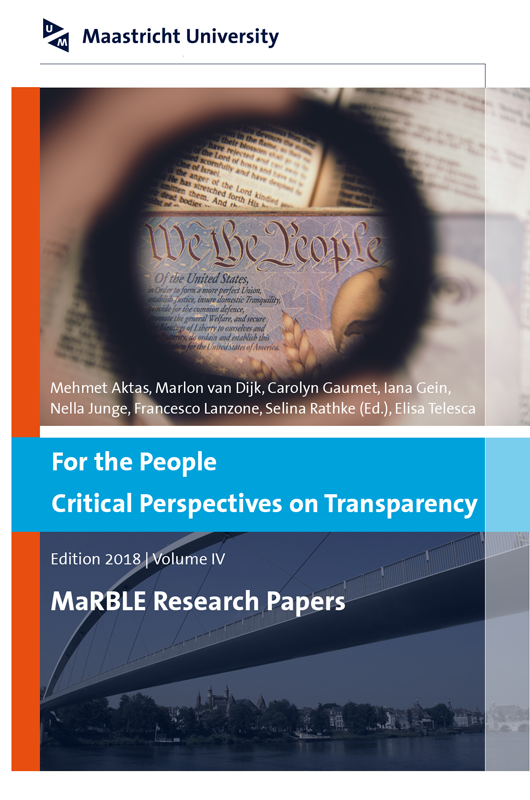 People and the ways in which they determine and shape directions of transparency – being made transparent and making transparent – are the foci of this volume’s eight contributions. The first five contributions can be related to upwards transparency in that they discuss different situations in which people are made transparent. The last three contributions follow the downwards transparency perspective in that they discuss how institutions and organizations can, or cannot, be transparent for people and how people themselves may demand more transparency. Bessire, D. (2006). Transparency: a two-way mirror? International Journal of Social Economics, 32(5), 424-438. Hansen, H., Christensen, L., & Flyverbom, M. (2015). Introduction: Logics of transparency in late modernity: Paradoxes, mediation and governance. European Journal of Social Theory, 18(2), 117-131. Lazarus, H., & McManus, T. (2006). Transparency guru: an interview with Tom McManus. Journal of Management Development, 25(10), 923-936. Meijer, A. (2009). Understanding modern transparency. International Review of Administrative Sciences, 75(2), 255-269.